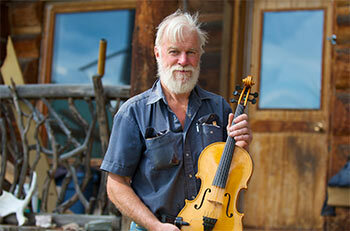 There is a vibrant Arts Community in the Robson Valley with many artists and craftspeople making the area their home. Samples of work done by local painters, woodworkers, potters, photographers and tactile artists can be found in the Whistle Stop Gallery in McBride and the Valemount Visitor Centre. The wood found in northern BC is ideal for musical instruments and there are several luthiers in the Valley. Luthiers specialize in building and repairing stringed instruments such as guitars and mandolins. Keith Berg is a world renowned French horn maker resides in Dunster, providing his superb work to musicians around the world. There is also an annual Harp Colony event in McBride that attracts harpists from across Canada. Dunster is the home of the Robson Valley Music Festival and artists come from across North America to perform during this magical weekend. If you are a fan of any genre there will be something that teases your senses. Bluegrass, folk, jazz, soul, reggae, world music and more are all represented here. There are active theatre groups in both Valemount and McBride. The McBride Roundhouse non-profit society makes it its mission to bring professional musical and theatrical entertainment to the Robson Valley. Valemount Community Theatre is an initiative of the Valemount Arts and Culture Society.